In recent months, I have been working on two chapters to a book on death in Ireland. The book is being edited by my friend and colleague, Professor Salvador Ryan of Maynooth, and I am writing about stories of death in the Irish way associated with the hymn writer Henry Francis Lyte and with the 6th Earl of Mayo. This afternoon, two of us went to the village of Johnstown, north of Naas, Co Kildare, to photograph Lord Mayo’s grave and the old churchyard where he is buried. Johnstown is just 2 km north of Naas, off the N7 at junction 8, and about 25 km from Dublin City Centre. It is close to racecourses like Naas, Punchestown and the Curragh ad so the surrounding countryside is the heart of the bloodstock industry, with many well-known Kildare stud farms. The Main Street was once part of the main road between Dublin and Cork and Limerick. The main road eventually by-passed Johnstown in 1964 When the Naas Dual Carriageway was finished in 1964, Johnstown was bypassed, and Johnstown became a sleepy village. But in recent decades Johnstown has been encircled by housing estates, so that it has become a commuter town too. There is evidence of human activity in the area from early times, and the “holed” stone in a field at the southern end of the village is said to be astronomically aligned to the mid-summer solstice. But this afternoon I was in search of the ruins of the mediaeval church. From the Middle Ages, this was a priory of the Knights Hospitaller of Saint John of Jerusalem, or the Knights of Rhodes, who give their name to the village, which was known in Irish as Fraoch Oileán. The knights’ regional headquarters or commandery was at nearby Kilteel, and they also had an abbey in Naas. Nearby Palmerstown takes its name from pilgrims who visited the Holy Land and brought sprigs of palm as a token of their pilgrimage or, perhaps, after a family named Palmer. Palmerstown was one of the properties held by the Knights Hospitallers in Ireland and confirmed by Pope Innocent III in 1212. Thomas Hibernicus of Palmerstown was living in the Monastery of Aquila in Italy in 1270. His major work was a collection of flores or “flowers) of wisdom” from nearly all the then European Doctors of Philosophy or Theology. His book became a reference work and was reprinted many times in the following centuries. The Flatsbury or de Flatebry family owned Palmerstown as early as 1286, although the knights held on to the church at Johnstown. The old church has a number of mediaeval fragments, including a ruined piscina, the octagonal base of a mediaeval baptismal font, and a flat stone slab with carved with coats of arms representing the Wogan and Flatsbury families. This has been taken to be the grave slab of James Flatsbury who married Eleanor Wogan in 1436. In 1503, Philip Flatsbury, a scholar and scribe, compiled The Red Book of Kildare for Garret ‘Og’ Fitzgerald, 9th Earl of Kildare. This book, which lists documents relating to the Fitzgerald estates, went missing after the Rebellion of ‘Silken Thomas,’ 10th Earl of Kildare, but is now in Trinity College Dublin. The church has been in ruins since the 16th century, but continued to be a burial place for the Bourke family, Earls of Mayo. There are Bourke graves throughout the churchyard but it is best-known for the grave of the 6th Earl of Mayo, the viceroy who was killed in India in 1872. In the 1641 Rebellion, James Flatesbury took the side of the Confederates, and his estates including Johnstown and Palmerstown, were confiscated. They were later granted to Theobald Bourke, third son of John Bourke, a Captain of Horse under the Duke of Ormond in the Confederate Wars. He had settled in Kill but moved to Palmerstown around 1688. He was the Sovereign (Mayor) of Naas in 1700, 1711 and 1724. His nephew, John Bourke, acquired the titles of Lord Naas (1776), Viscount Mayo (1781) and Earl of Mayo (June 1785). Joseph Bourke, Archbishop of Tuam, succeeded as the third Earl of Mayo before he died in 1807. The charm of the village is enhanced by the estate cottages built in the ‘Gothic Revival’ style in the 19th century, and they are mentioned by William Makepeace Thackeray in his Irish Sketchbook in 1842. The most famous member of the family was Richard Southwell Bourke (1822-1872), 6th Earl of Mayo. He was born in Dublin on 21 February 1822 and was known in earlier life as Lord Naas, and was the Chief Secretary of Ireland on three occasions between 1852 and 1866. In 1868, the Disraeli government appointed him Governor-General and Viceroy of India, but he was assassinated there in February 1872. Before leaving for India he had chosen a place for his grave in Johnstown, and he is buried within the walls of the ruined church, under a Celtic cross. After his death, the government decided that a new Palmerstown House should be erected at public expense in his honour. The next owner of Palmerstown was Dermot Robert Wyndham Bourke, who was 21 when his father was assassinated and who succeeded him as 7th Earl of Mayo. In 1891, he was instrumental in convening a meeting in Palmerstown that led to setting up the Kildare Archaeological Society. The seventh Earl of Mayo was appointed to the new Senate by the first Irish Free State Government in 1922. His house was burned down during the Civil War in January 1923. Lord Mayo received compensation and the house was re-built, and he lived in one of the gate lodges on the estate until the house was rebuilt. He moved to England soon after and died in a nursing home in London in December 1927. Palmerstown House and stud were sold to WJ Kelly, a gentleman’s outfitter in Clanbrassil Street, Dublin, who was known to his friends as ‘Trousers’ Kelly. He established Palmerstown as one of the leading studs in Ireland. Opposite the old churchyard, the Johnstown Inn was once a busy coaching stop. The first inn was built on this site in the 1640s, during the Confederate wars. It became known as the Mayo Arms and the Cork mail coach was stopped there and burned at the start of the 1798 Rising. In the 19th century, it was the meeting place of the Kildare Hunt. More recently, it was known as the Osta John Devoy. From Johnstiown, we drove out into the countryside, through the stud farms and the open fields, past the racecourses at Punchestown and Naas, before eventually arriving in Newbridge, where we stopped for double espressos in the café at Newbridge Silverware. In recent days I came across a photograph taken 80 years ago during Cardinal Pacelli’s amazing flying visit to the US in 1936 to meet President Roosevelt. Pacelli later became Pope Pius XII, and although he was not yet Pope he became the first Pope to have ever visited the US at any time in his life. Before the cardinal met Roosevelt in Hyde Park, he was photographed with a number of key figures involved in the visit, including Joseph P Kennedy, father of the Kennedy brothers, the amazing Count Enrico Galeazzi, and Frank Comerford Walker, the grandson of John Comerford, a Kilkenny-born emigrant whose descendants gave the Comerford family name to a large cinema chain in Pennsylvania. 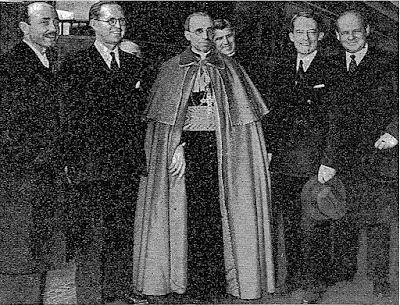 Cardinal Pacelli visited the US for two weeks in October-November 1936 as the Vatican Secretary of State, and at the time he was the highest-ranking Catholic Church official ever to visit the US. During his visit, Pacelli met President Franklin D Roosevelt, investigated Roosevelt’s radio critic, Father Charles Coughlin, and visited New York City, Washington DC, Boston, Saint Paul, Minnesota, and Chicago. The media nicknamed him “the Flying Cardinal” due to his five-day coast-to-coast air tour. Pacelli planned to silence Coughlin for Roosevelt in exchange for his support against Communism and in return for diplomatic recognition of the sovereignty of Vatican City. The visit was so important to the Vatican that during Pacelli's absence from Rome Pope Pius XI cut short his holiday in the Castel Gandolfo and returned to the Vatican. Pacelli finally met with Roosevelt at the president’s home in Hyde Park, New York, for two hours over lunch on 5 November, the day this photograph was taken. Pacelli congratulated Roosevelt on his election victory the previous day. At a press conference, Cardinal Spellman told the press corps that they were banned from asking any questions about Father Coughlin, and warned them Cardinal Pacelli would not answer such questions. Frank Comerford Walker (1886-1959), who is seen in this photograph on the margins of this meeting between Rossevelt and the future Pope, was an American lawyer and politician. He later became the 51st US Postmaster General (1940-1945), and also served as the chairman of the Democratic National Committee (1943-1944). He was born on 30 May 1886 in Plymouth, Pennsylvania. His father was David Walker (1848-1902), who was born in Luzerne County, Pennsylvania, in October 1848 and who died on 7 May 1902 in Butte Silver Bow County, Montana. He was involved with mining interests in Butte until he died in 1902. His mother was Ellen Comerford Walker (1851-1916). Ellen ‘Ella’ Comerford Walker was the eldest of ten children of John Comerford (ca 1820/1827-1880), who was born in Co Kilkenny. He was an anthracite coal miner who emigrated to the US, probably in the late 1840s. He married Catherine Devey, also from Co Kilkenny, in Saint Kieran’s Church, Heckscherville, Schuylkill County, Pennsylvania, in 1850. John died in 1880 and is buried in Saint Vincent de Paul Cemetery in Pennsylvania. John and Catherine Comerford had ten children, five daughters and five sons. Their sons included Father Thomas J Comerford (1855-1924), who was a close friend of and baptised John Mitchell (1870-1919), President of the United Mine Workers’ Union, and Michael E Comerford (1865-1939), founder of the Comerford cinema chain. ● 2a, (Judge) Thomas Joseph Walker (1878-1945). Born 25 March 1878. Educated All Hallows’ College, Salt Lake City, Georgetown University (classical studies), and he University of Virginia (LL.B, 1902). In September 1940, he was appointed a judge of the US customs court in New York. He married on 7 June 1905 Maud Galen, daughter of Hugh and Matilda Galen of Helena. They had no children. Ella (Comerford) and David Walker are buried in Saint Patrick’s Cemetery, Butte, Silver Bow County, Montana. Their second son, Frank Comerford Walker, entered Gonzaga University in Spokane, Washington, in 1906, and earned a law degree from Notre Dame Law School in 1909. He then joined his older brother Thomas in a law practice in Butte, Montana. In 1913, he was elected to a term as a Montana state representative. During World War I, Walker volunteered for the US Army. He became a first lieutenant and saw action on the Western Front. After the war, he returned to his law practice in Montana. The two Walker brothers had an impressive list of clients from the railroad and mining industries. Frank developed his political skill and genius in the period known as the “Copper Wars,” when capital and labour battled openly in the mining industry. He developed an astute political mind through experience with political figures like the great Senator from Montana, Thomas ‘Tea Pot Dome’ Walsh, who was his mentor and friend for over 30 years. In 1925, Frank moved to New York City, where he become manager and general counsel of Comerford Theaters, a chain of cinemas owned by his uncle Michael E Comerford (1865-1939). In New York, he expanded his political activities, and he supported Franklin D Roosevelt’s campaigns for governor in 1928. In 1931, he co-founded the Roosevelt for President Society. In 1932, he became Treasurer of the Democratic National Committee (DNC), and until Roosevelt’s death, he was one of his closest advisers. 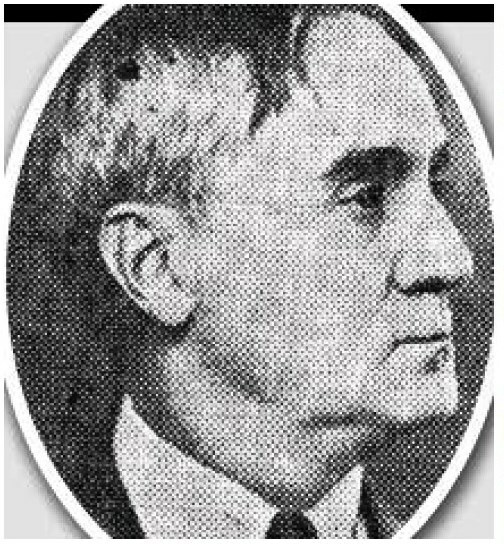 When Roosevelt became President in 1933, he appointed Walker executive secretary of the National Emergency Council, a New Deal agency related to the NRA. He was responsible for drafting the 1934 Housing Bill which had an impact on the depressed construction industry, creating the Federal Housing Authority, benefiting the dispossessed and homeless, bailing out farmers, enabling the mortgage industry to recover, and creating jobs for the unemployed. He was appointed Postmaster General on 10 September 1940, succeeding James Farley, who had also chaired the DNC and was Roosevelt’s campaign manager. As Postmaster General, he established the V-mail system to reduce the weight and bulk of mail to US troops abroad and expanded the delivery of mail to rural areas throughout the US. While he was Postmaster General, he continued his role as political adviser, often taking part in matters far removed from the Post Office. For instance, during the negotiations before the attack on Pearl Harbor December 1941, he was in regular contact with the Japanese Ambassador, Admiral Kichisaburō Nomura. During World War II, Walker helped FDR educate an isolationist population in the US about the world, Lend Lease, Hitler, Mussolini and Tojo. With the erosion of human rights and “human dignity held hostage” in Europe and Asia, Walker stepped to the fore. His speeches were broadcast nationally. Roosevelt and Walker fought hard against the Republican Party’s platform of isolation. Their warnings of German aggression and stories of the Holocaust were limited by partisan Republican politics. In 1943, Walker also became chairman of the DNC, serving until 1944. In 1944, he stepped down from the DNC, and was succeeded by Robert Hannegan. In May 1945, Walker announced his retirement as Postmaster General, to allow President Harry Truman to appoint his own candidate to the office. Truman selected Hannegan to succeed Walker and later in 1945, he appointed Walker a member of the US delegation to the United Nations General Assembly at its first session in London. Later he returned to his business interests in New York as director of WR Grace & Co and the Grace National Bank of New York. Frank Comerford Walker also served on the Board of Lay Trustees of Notre Dame University, worked for the Notre Dame Foundation, and was a member of the Notre Dame Club of New York. He was given an honorary degree in 1934 and the University’s Laetare Medal in 1948. He died in New York City on September 13, 1959, at the age of 73. He married Hallie V Boucher (1892-1969), daughter of Frank Boucher and Laura (Adams) of Butte, Montana. She was born on 28 August 1892 in Butte, Montana, and died on 9 December 1969 in Greenwich, Connecticut. They are both buried in Saint Patrick’s Cemetery, Butte, Montana. Frank Comerford Walker donated his papers to the Archives of the University of Notre Dame in 1948, although the entire collection was not transferred until after his death. An oral history was conducted with his son and daughter, Thomas J Walker and Laura Walker Jenkins in 1990. A compelling part of the story is the personal friendship between FDR and FCW – a friendship that was uncharacteristic of Roosevelt’s relationship with most other colleagues. They shared similar political philosophies and party politics from the time they first met in Montana. They made speeches for each other, travelled the country together, and shared many friends. His life, his deeds and his speeches depict many of the humanitarian concepts and ethics of the New Deal he helped to bring to fruition as aide to FDR. His great record of service and his special, if not secret, relationship with Roosevelt is, however, missing from the commonly known history of the FDR administration.